Hey there! Thanks for dropping by [BWV] Blue Water News! Take a look around and grab the RSS feed to stay updated. See you around! Outstanding viewing of sea otters and their pups now in Elkhorn Slough. We offer year round naturalist-led kayaking adventures at www.bluewaterventures.org. When viewing sea otters with pups be sure to give them extra space and use a telephoto lens. Its a critical time right now as pups are nursing and learning skills needed to survive on their own. Enjoy respectively! 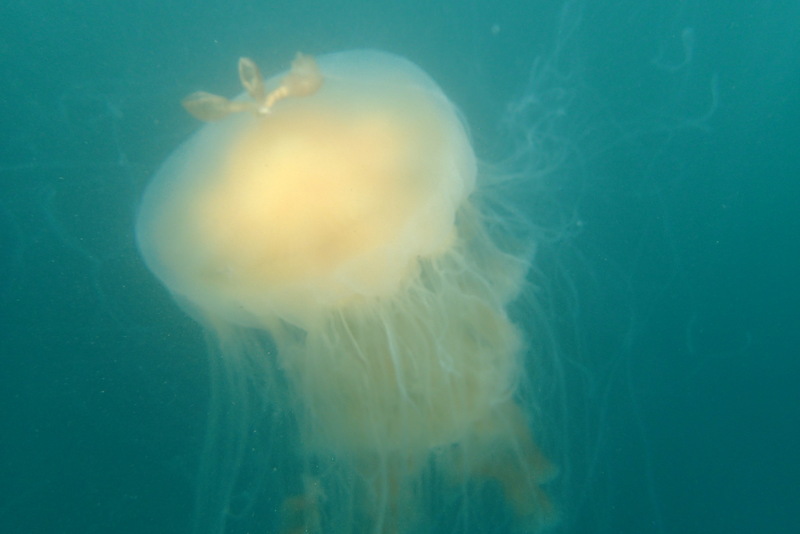 Imagine a huge egg cracked over an indigo blue fry pan the size of a trampoline and you have found Phacellophora camtschatica, the egg yolk sea jelly! 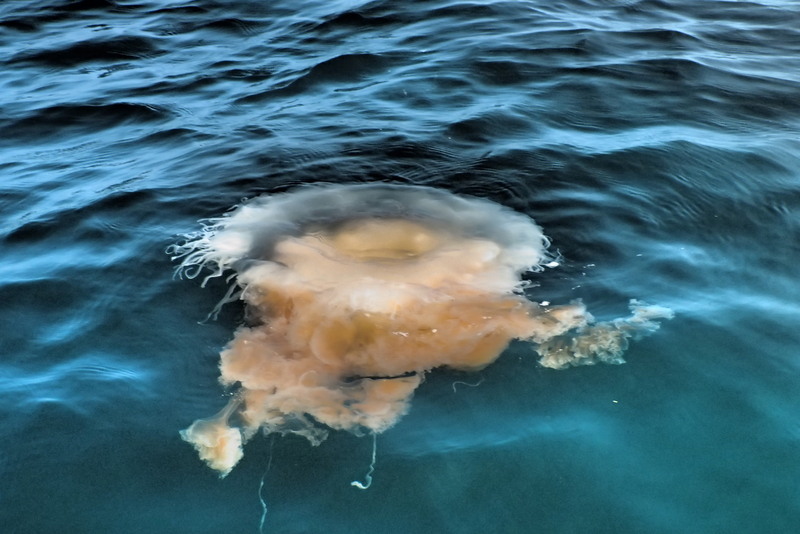 A savory meal for the oddly shaped Mola Mola sunfish, other gelationous creatures and sea turtles, this fascintating sea jelly resides in Monterey Bay National Marine Sanctuary. While out looking for humpback whales this morning by kayak, we paddled by numerous gelantionous species such as Chrysaora colorata, formerly Pelagia colorata and commonly known as the Purple sea jelly. Acting like a submerged spider web, the egg yolk sea jelly’s convoluted tangle of tentacles serves to snare its prey. Our Bioluminescence paddle last night in Elkhorn Slough was super cool! The water glowed with dinoflagellates, a single cell bioluminescent protist, a grouping of species that may have some animal as well as plant like characteristics. Some dinoflagellates are responsible for red tide as seen in the video below while others such as zooxanthellae feed their coral host through photosynthesis. Hope to Glow with you! There are those teachable moments be it in a traditional classroom or in an outdoor setting, that both student and teacher will never forget. On the final day of Coastal Kayak Explorer’s Camp we shared one of those moments. Each summer Blue Water Ventures based in Santa Cruz, CA offers a variety of marine science camps. Kim Powell, owner of Blue Water Ventures leads our summer camps. Kim has been conducting wilderness expeditions for students since 1985. She is a certified sea kayaking instructor through the American Canoe Association and Wilderness First Responder. Kim loves sharing her knowledge of the marine world through a fun and informative approach. 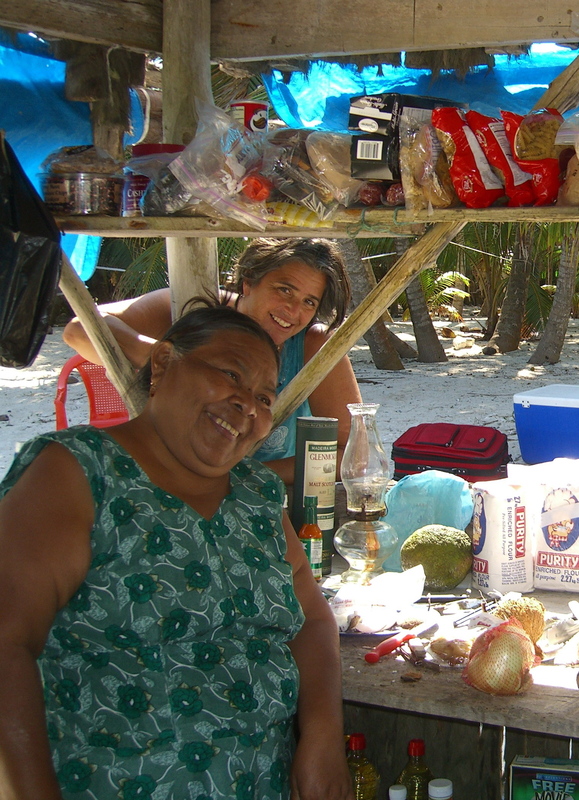 She has been the Director of Marine Science Camps in several Caribbean locations in addition to Central California. Here we go down under in Search of Sea Creatures. I had quite a few people find interest in the story about a sea lion climbing on board a kayak last Saturday in North Moss Landing Harbor. To Recap. It appeared as though an adult male sea otter was attempting to mate with a juvenile sea lion. The sea lion’s nose had been bitten much like when male sea otters bite female otters during their courtship. The female’s nose is often cut up. I had just rafted up my kayakers and was about to give instruction regarding our protocol for passing by the “sea lion dock” as we entered Elkhorn Slough when two animals popped up near our boats. I soon realized that what we were actually viewing was a sea otter and juvenile sea lion which quickly approached our boat and climbed onboard. Our focus quickly became easing our paddler and giving her instructions to stay calm as we moved away from the vicinity of the sea otter. Occasionally sea otters will attempt to climb on board. Part of our safety talk before launching is briefing our group on how to avoid such otters and our first protocol is to leave an area where one is. The last thing we needed was a sea otter attempting to climb onboard as well. We moved towards our destination, the Highway One bridge marking the entrance to Elkhorn Slough and then encouraged the sea lion to depart. Elkhorn Slough is an incredible place to experience wildlife. During our guided trips, we brief people in length about the appropriate way to interact with the marine mammals found in Elkhorn Slough. The Marine Mammal Act requires that humans stay 100 yards away from a marine mammal. As boaters launching in North Moss Landing Harbor, we are closer than 100 yards as soon as we are floating. Extra care is needed as you launch in North Moss Landing Harbor. If you are kayaking with a group, we suggest that you stay near the shore or hold onto the dock until everyone is ready to paddle. This will avoid people indadvertedly drifting too close to the harbor seals which are directly across from the launch area. A good general rule with marine mammals is if you alter the behavior of an animal, you are then too close. We site examples such as an animal looking around, swimming away, raising its head up or sliding off the beach. Pupping season for the harbors seals is about to begin and each year we hear reports of people trying to pick up a baby harbor seal or sea otter. While intentions are good, picking up a marine mammal is potentially lethal to the young animal as it might lead to separation from its mother. During the spring time, kayakers and other boats need to be extra careful not too disturb our local marine mammals and their pups. The picture posted here was taken from shore using a telephoto lens. A great place to photograph otters is at the end of Jetty Road in Moss Landing State Park. Remain quiet and photograph in the parking lot. The sea otters may be right below the parking area but do not climb down the cliff to get a better picture. The cliffs are unstable and the otters will become spooked. Our local marine resources from baby harbors seals to our vast wetlands are simply incredible. Lets enjoy in a respectful way. 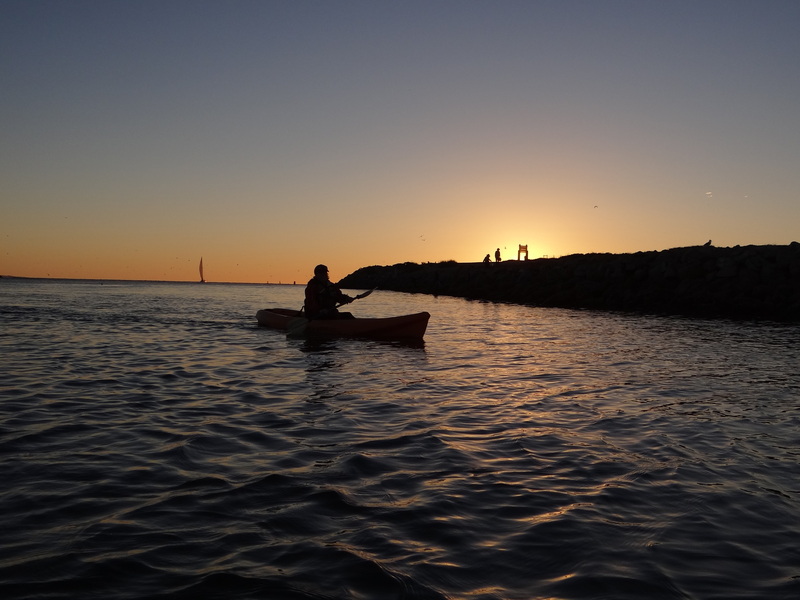 Elkhorn Slough offers an incredible location to kayak among sea otters, harbor seals sea lions and an array of migratory birds. We encourage teachers to get your students on a naturalist-led field trip to Elkhorn Slough. We offer a unique program that includes activities both in the water and on land to reinforce our outdoor curriculum. Most outfitters only spend a few hours on the water. We feel we offer something special. Our Elkhorn Slough program includes: wetlands ecology, endangered species, natural history of sea otters, harbor seals, sea birds and cultural history. Leadership and teamwork are key components of your field trip. After lunch, we pull a large seine net to examine our catch and discuss the theme of animal adaptations further. We offer a leisurely paced, full day in Elkhorn Slough from 9:30-2:00 for only $38 per person. This includes time on the beach for lunch and activities. Kayaking with Whales and Molas, Oh My! We paddled offshore late afternoon and discovered several humpback whales. So invigorating and intoxicating, surreal. Such encounters are raw, makes you feel truly alive in the presence of such beauty. Conditions were safe but challenging with lots of sea spray so no photos tonight. 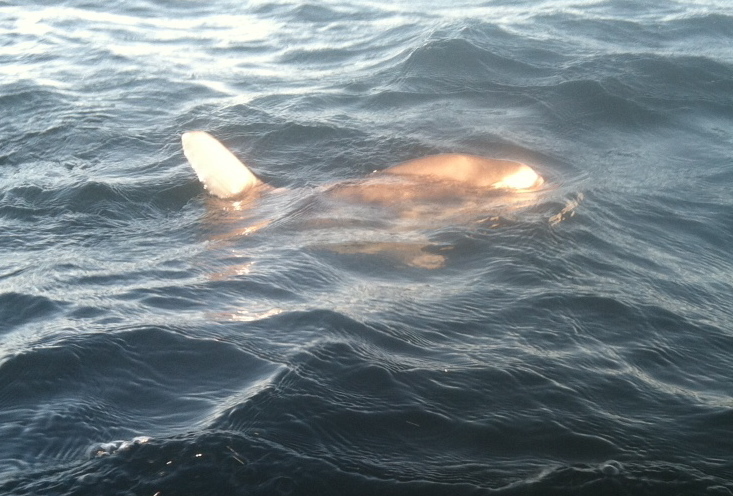 We did get a good look at a Mola Mola, our planet’s most hefty bony fish weighing in at 5000 pounds and 14 feet across. They start off as tiny larva floating among millions of other microscopic life forms. Their rate of growth is phenomenal … imagine a tadpole transforming into a 120,000 pound bull frog–thats relative to how much a Mola will grow during its life time! Molas have an affinity to sea jellies and are related to pufferfish. 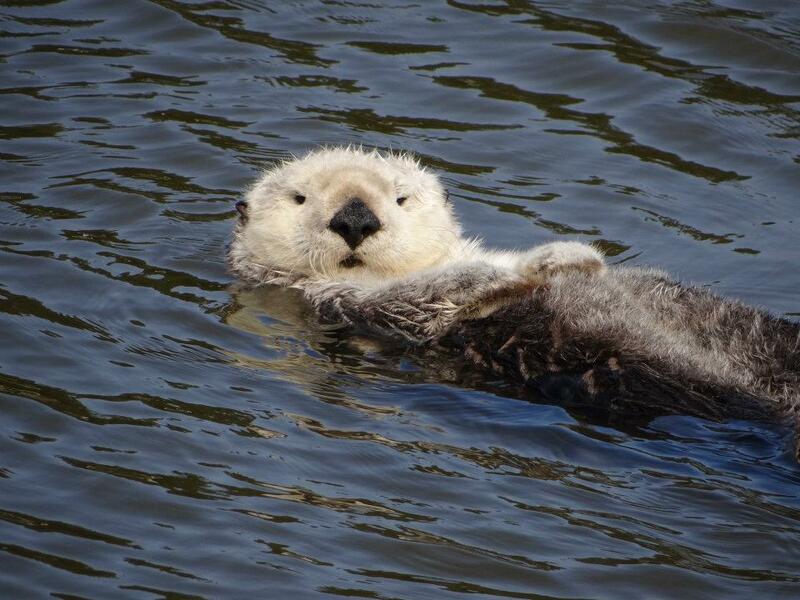 We’ve also had extraordinary viewing of sea otters this fall down in Elkhorn Slough. Plenty of space on our scheduled kayaking trips December through January 2013. Teachers, you still have ample time to get your students on a naturalist-led field trip to kayak among our seals and sea otters of the Slough. Join Blue Water Ventures as we search for whales abd wildlife in the incredible Monterey Bay National Marine Sanctuary! Took my neighbors out for a early morning paddle to check out our local sea otters when we encountered 2 mama gray whales and their babies resting in the kelp beds off of West Cliff Drive, Santa Cruz. Our first encounter really caught us off guard as a baby whale surface 25 feet from our boat. We had just been enjoying activity off of seal rock when a baby whale popped up without any warning. Very incredible! We quickly backed up, tapping our boat letting the youngster know our location. As we were heading back towards Cowels Cove, two more gray whales suddenly appeared without any warning as seen in this video. They seemed to be resting in the kelp beds and clearly spyhopped to check us out. Whales are known to raise their heads out of the water to take a look around, a behavior referred to as spyhopping. They may have been intrigued by not only us, but the surfers who were just beyond the whales. What an amazing day and its not even noon! In 1988, I was traveling through southern Belize and visited the remote Mopan Mayan village of San Antonio. It was there that I was mistaken for a Duende, a forest dweller, trickster and dwarf. Duende lives deep in the jungle. He is thought to slumber in a forest cave and emerge during daylight hours to sheepishly observe humans. Two legged kinds be weary if the trickster appears near the sacred Ceiba tree. Perched among the buttressing roots, Duende may strum his guitar for you, an intoxicating ploy. It is highly recommended to respectively wave your four fingers but hide your thumb. Duende may wish to acquire your opposing appendages as he is missing his own. The forest dweller often wears a wide brimmed hat and stands a mere three feet tall which accounts for my mistaken identity. 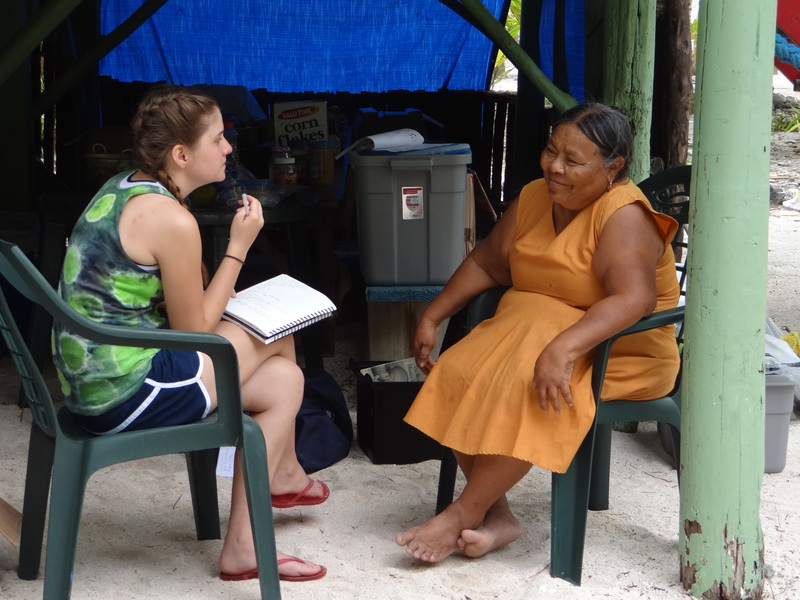 Encouraged by the peace corp volunteer, my traveling companions Korinn Saker, Patty Smith and I threw together a skit for the Mayan Community. We chose a childhood favorite of mine that I fondly remember as “Little Nemo”. Concealed by a sheet, Korinn wrapped her arms around my waist becoming my arms, my arms were my legs and my head sported a wide brimmed hat. Voila, a tiny little creature had emerged on stage and sloppily performed such antics as brushing one’s teeth. Korinn, unable to see my face kept missing the teeth and polishing the brow, an act which I alone found hilarious. After having my brows polished and my composure retrieved, I glanced out at the audience expecting cries for an encore. Instead, I was met by a solemn crowd. There was not a smile, snicker or unpolished eyebrow raised in an exclamation point among the 100 or so brows in the audience. I felt like shrinking, but that was part of the problem so I quickly took a bow and retreated behind the makeshift curtain. Tucked away in our hammocks that night, we were told by our host family that Little Nemo was thought to be a Duende. Ah…..it all made sense now as I instinctively checked in with my thumbs!